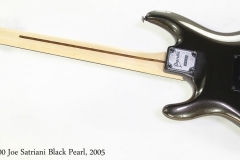 The Ibanez JS1000 Joe Satriani model was built from 1994 to 2014 and for much of that time available in the Black Pearl finish seen here. Joe Satriani has been highly influential for decades, dating back to giving Steve Vai and Kirk Hammett lessons and on to his own work as a sideman and successful solo career. 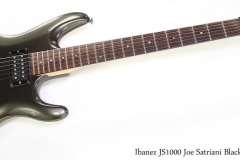 There’s a lot to like in the Ibanez JS1000. The design is very effective, and based on the real needs of a highly skilled performer. Functionally, it is comfortable, well balanced, relatively light, rock solid and well built. The nicely contoured body is built of Basswood, paired with a Maple neck and Rosewood fingerboard. Fretwire is Dunlop 6105, a medium jumbo wire that’s relatively wide but not exceptionally high. The hardware choices include an Ibanez Edge trem based on the Floyd Rose locking design, including a locking nut at the head, DiMarzio pickups – a PAF Pro at the neck and a Fred at the bridge, with coil tap and high pass filter switches on the volume and tone controls. This Ibanez JS1000 dates to 2005 and was built at the Fuji-Gen plant at Matsumoto in Japan. It is in very good clean condition, with only the slightest wear. You may notice that it has a pair of serial numbers. This is apparently normal for higher end Ibanez models, where the factory wants to keep track of both the body and neck. 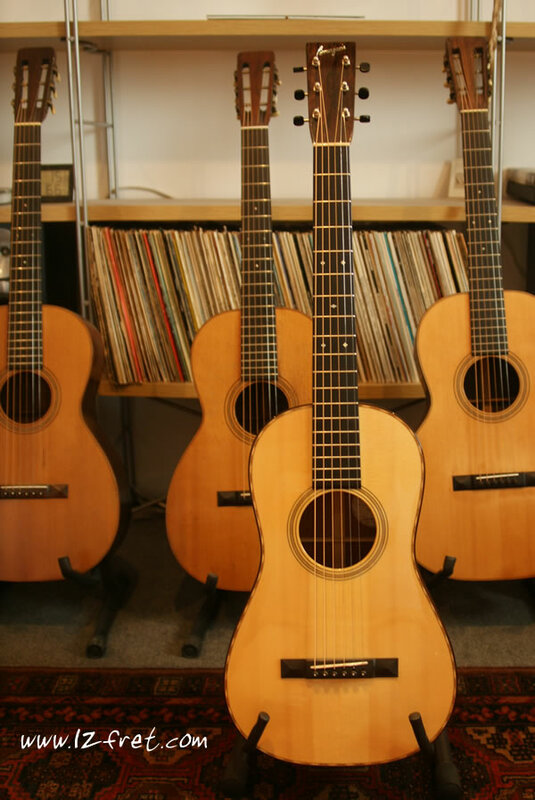 We date it from the serial on the back of the headstock.